The past few years I have completed one full tower (Corsair 800D) and three super tower (two Corsair 900D and one CaseLabs STH-10) builds. These builds have won their fair share of case modding contests at Dreamhack Austin, QuakeCon and most recently the Gigabyte Mod2Win event. Although these full size cases are excellent for building extreme rigs, they are difficult to move to the various LANs that I attend (Dreamhack Austin and QuakeCon). Their sheer size and weight are prohibitive for transporting easily. 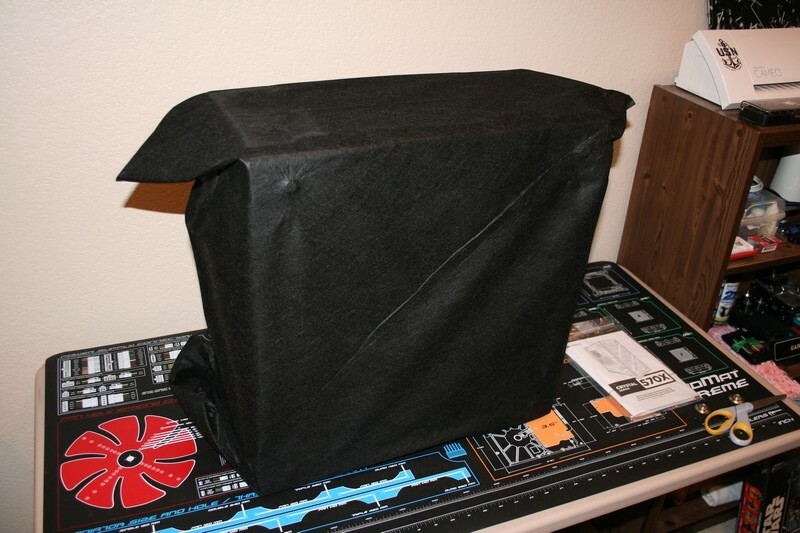 My latest build in a Corsair 900D case weighed in at just over 80 pounds! 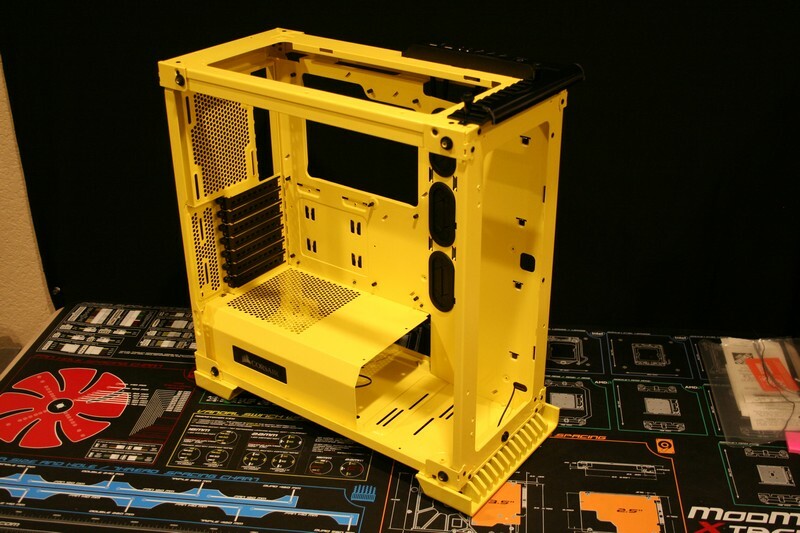 Many people have also commented that case modding is too expensive and requires too many specialized tools to fabricate the mods. Although some of the more extreme builds do utilize advanced tools (i.e. 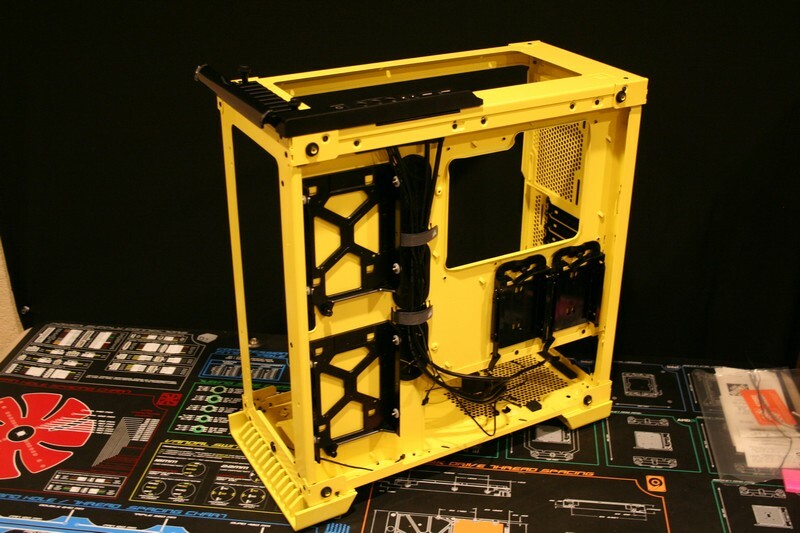 laser cutters, CNC machines, etc), it is possible to pull off a successful case mod with minimal tools. This build will be completed with normal hand tools, with the exception of a dremel for minor cutting. After carefully contemplating various designs, I have settled on the PC Master Race (PCMR) theme. 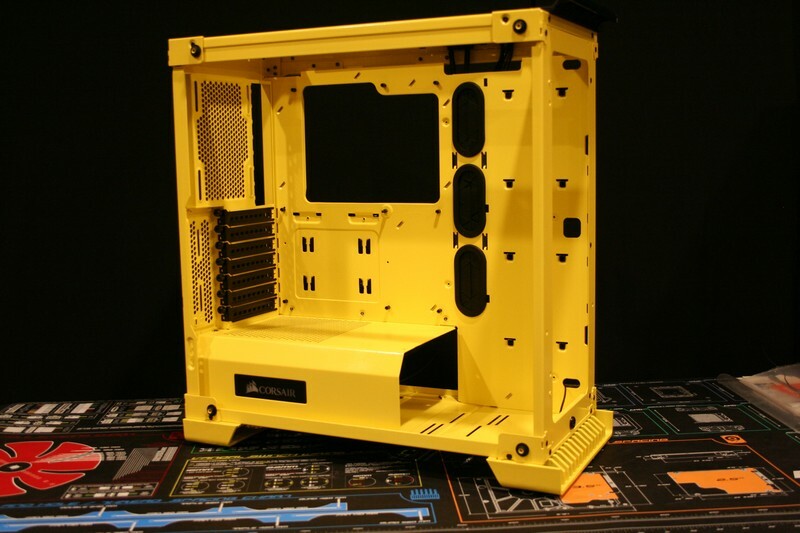 The yellow, white and black theme goes perfectly with the Corsair color scheme of yellow and black. 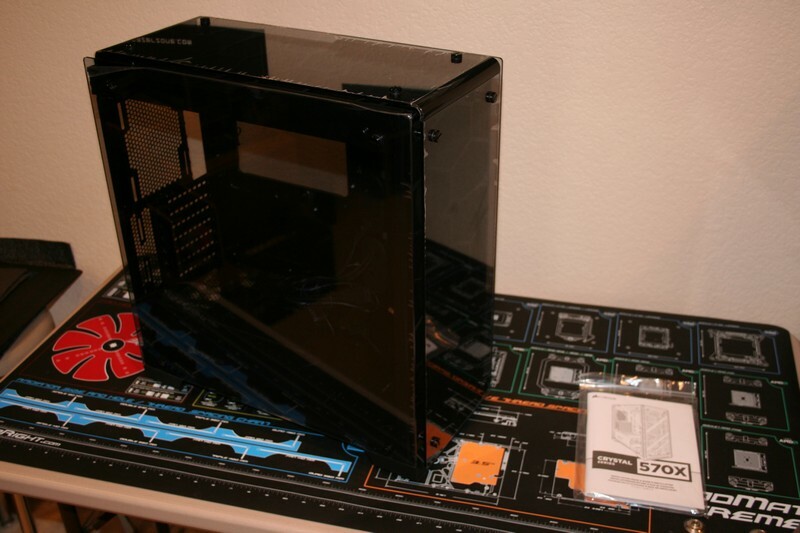 I have also decided to use a mid-tower case since it would be easier and lighter to transport. Instead of a full watercooled build consisting of reservoirs, pumps, radiators, fittings and tubing, I wanted to try an All-In-One (AIO) unit due to the simplicity in installation and lower overall cost. 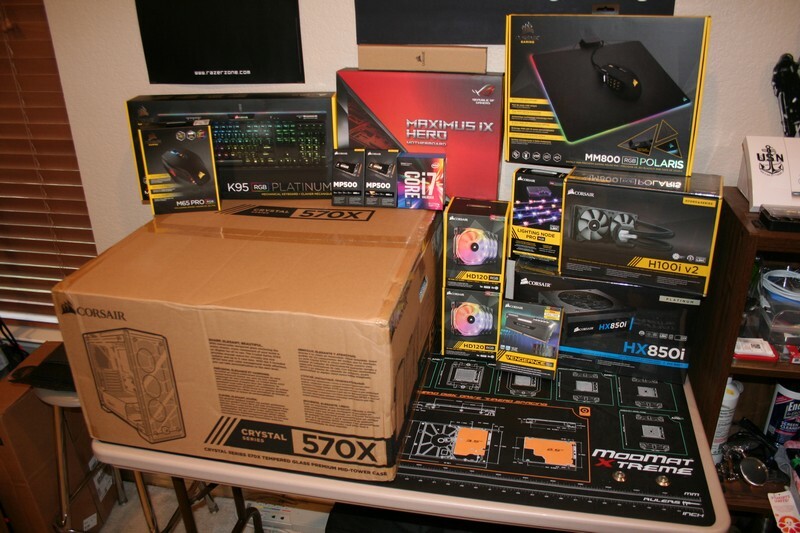 Corsair was gracious enough to sponsor me again for this new build and I look forward to highlighting their new Crystal 570X case and showcase a lot of their parts. Last edited by NavyChief; 04-11-2017 at 07:06 PM. 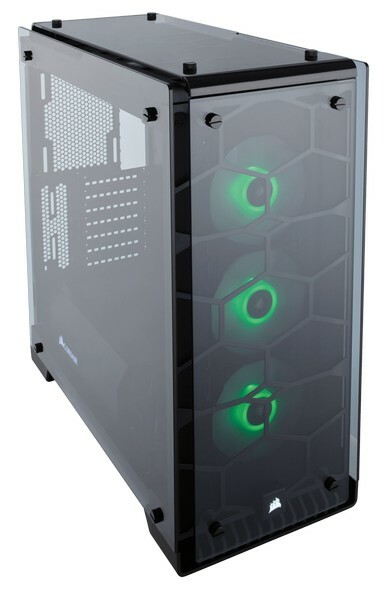 Here is a shot of the Corsair Crystal 570X from their website. I have received most of the components over the last few days. Here is a shot of them all ready for action. 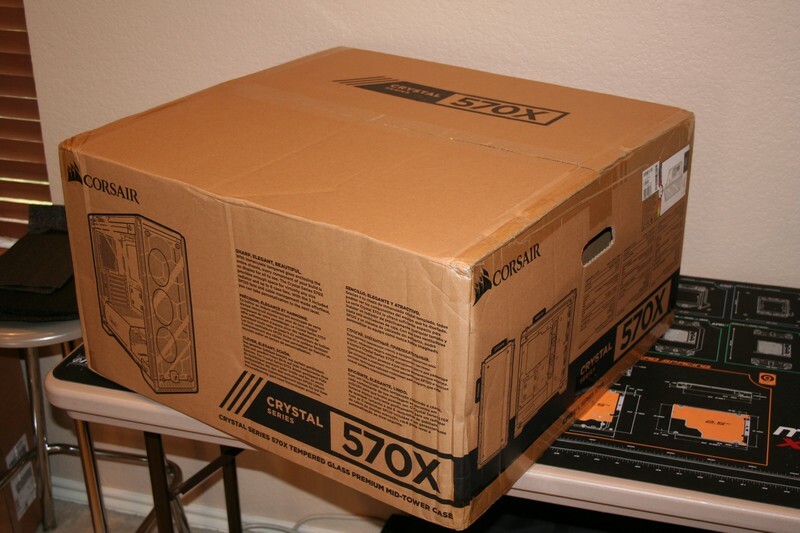 Here is the Corsair 570X carton. I am used to cases standing upright in the box and this is the first where it is laying sideways. Love the protective wrapping they used to cover the case in the packaging. Will definitely be keeping it for use whenever I have to transport the case. The case is absolutely stunning! 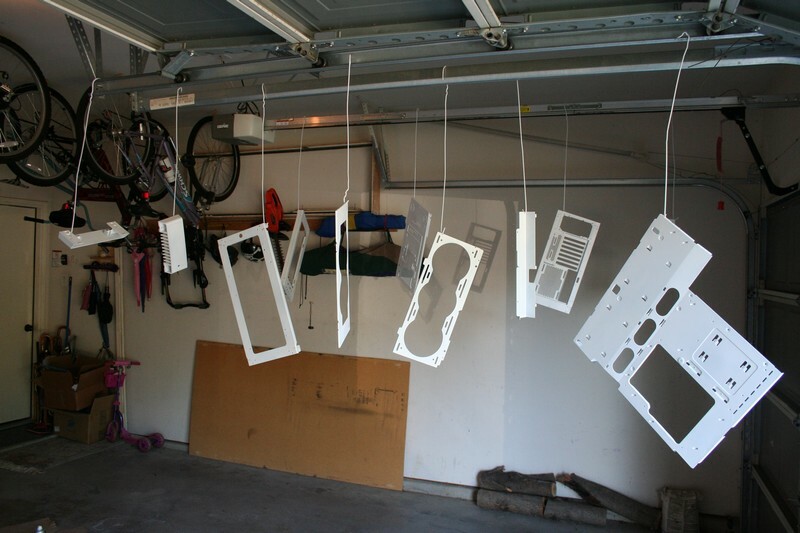 All that tempered glass is just screaming for some color to be applied to the interior. The protective glass film is still in place. Everything that could easily be removed has been taken out. Was thinking of cutting a pass-through opening in the PSU cover but decided against it so that the case could remain stock. Wow! This case has a lot of rivets to remove!! Here is pile when all the panels were de-riveted. Panels all ready for painting. 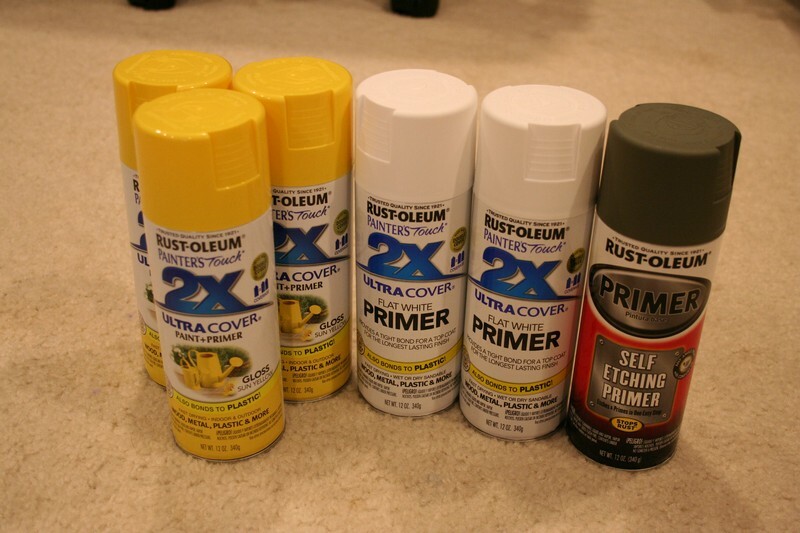 I will be using Rust-oleum 2X Ultra Cover Flat White Primer as a base so that the yellow color stands out easily. 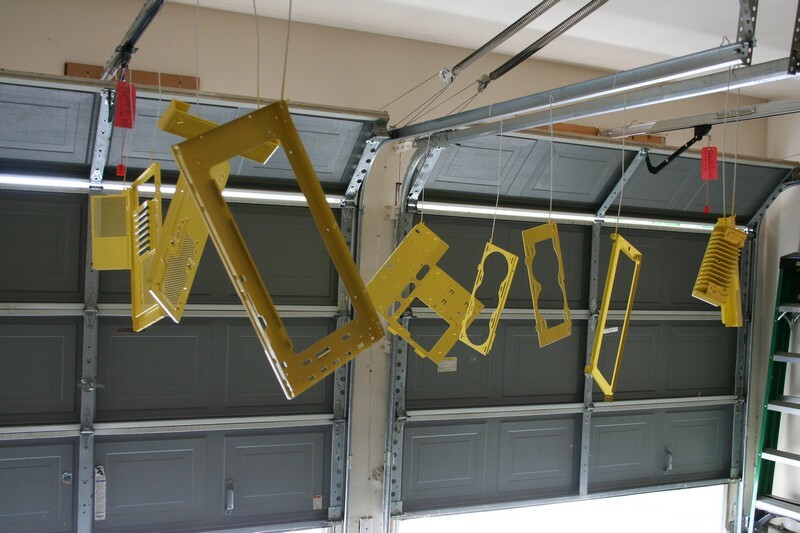 The yellow paint is Rust-oleum 2X Ultra Cover Gloss Sun Yellow. 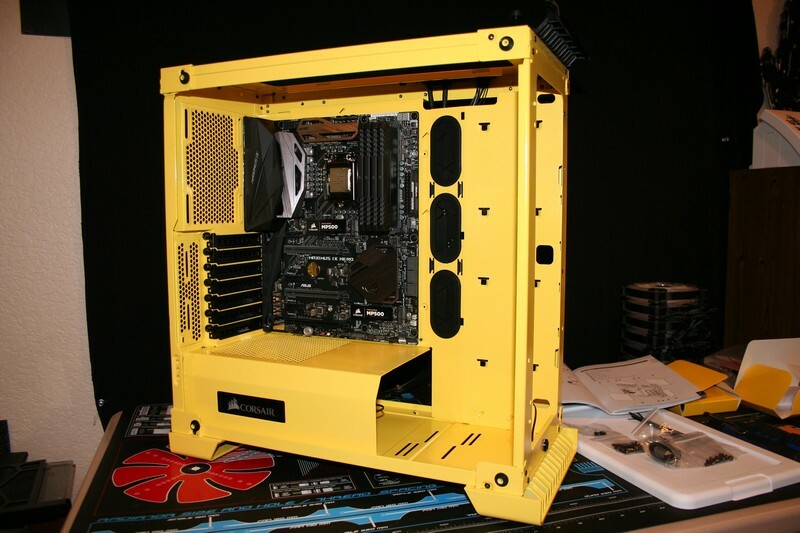 I wanted to use the same brand to ensure compatibility with the paints and the gloss yellow should stand out nicely. This afternoon I was able to get the 2 coats of flat white primer applied. 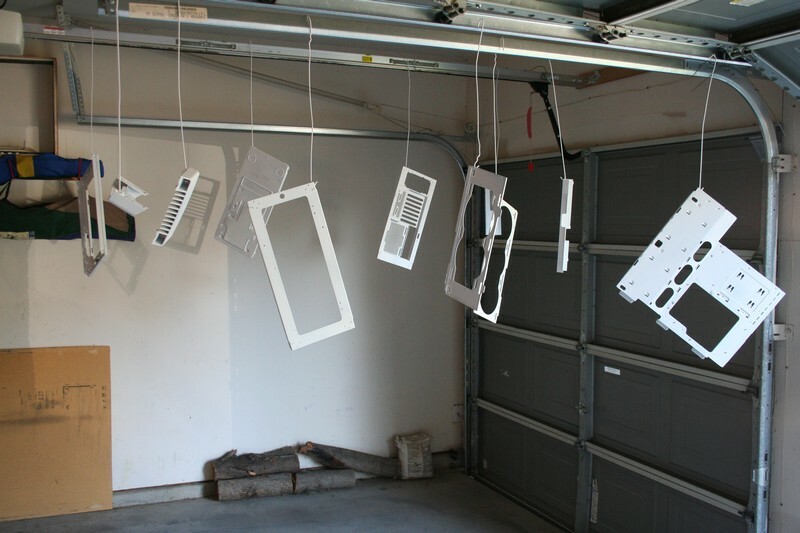 They are now hanging in my garage. Tomorrow they will get their yellow coatings. There are the little corner pieces that hold the glass panels in place. This morning I applied the 2 coats of Gloss Sun Yellow to the pieces. 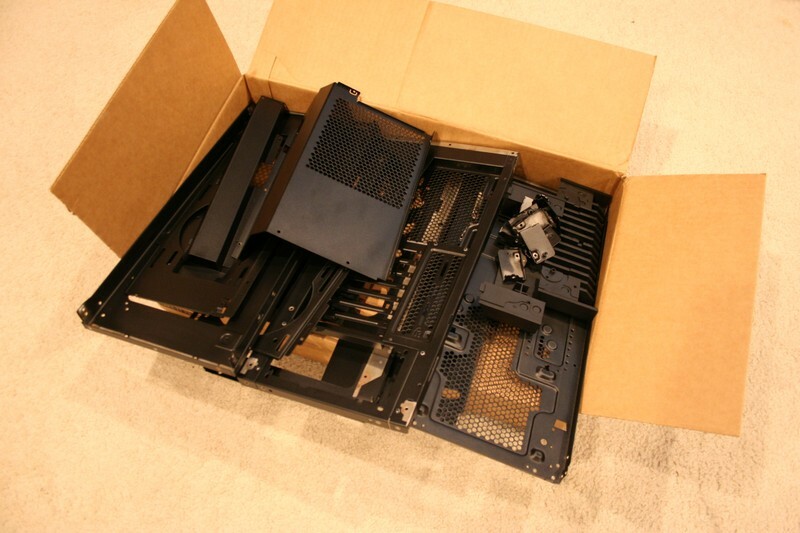 One full day to dry and I should be able to start re-assembling the case tomorrow. 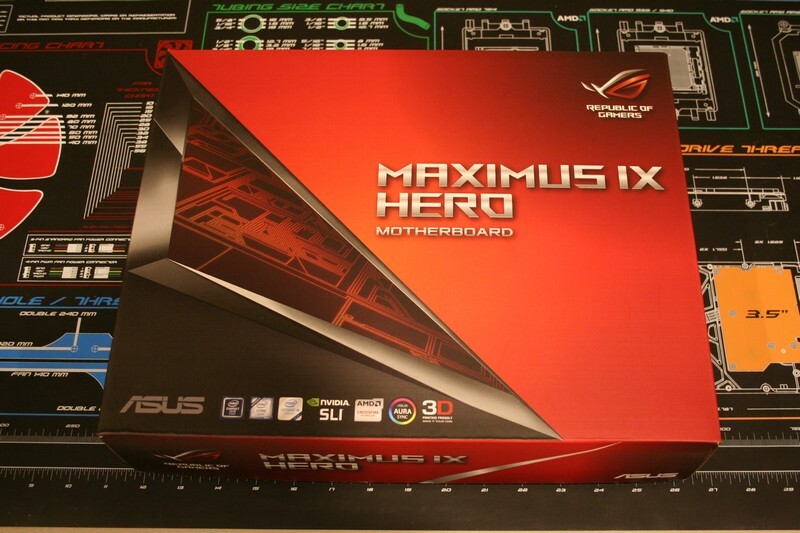 The motherboard for this build is the ASUS Maximus IX HERO. 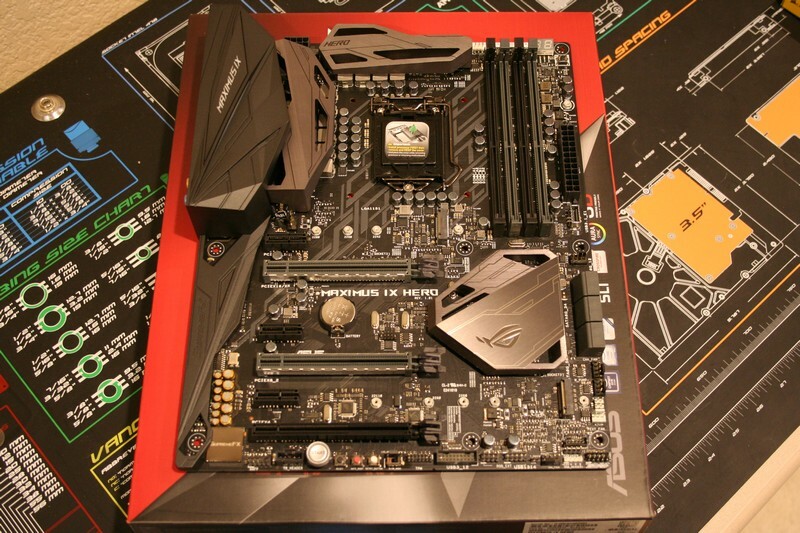 It utilizes the LGA 1151 CPU socket and the Intel Z270 chipset. 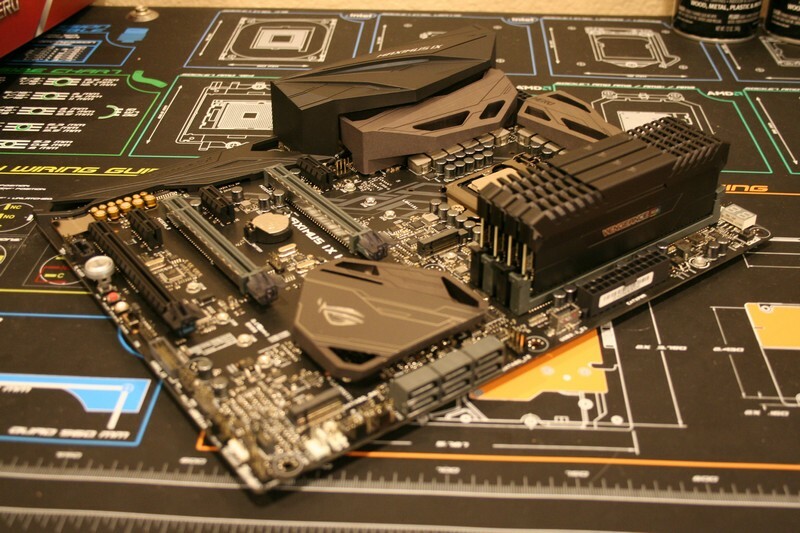 The motherboard is a beautiful blend of black and gunmetal gray. 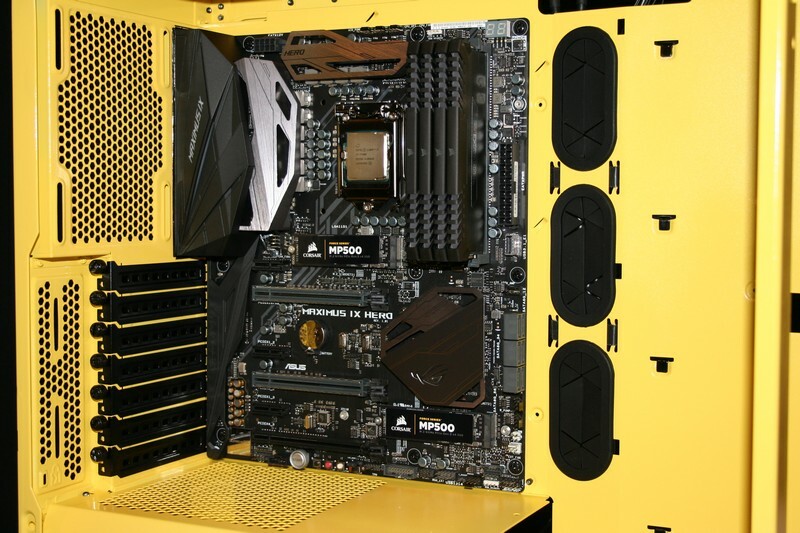 The large metal heatsinks provide cover for all the important parts and the motherboard backplate area. 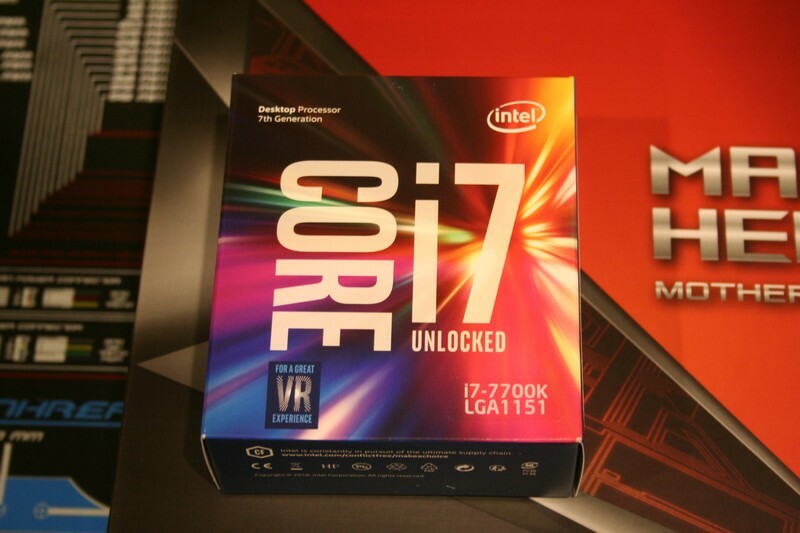 The CPU to be used is the Intel i7 7th Generation Core i7-7700K Kaby Lake unlocked version. 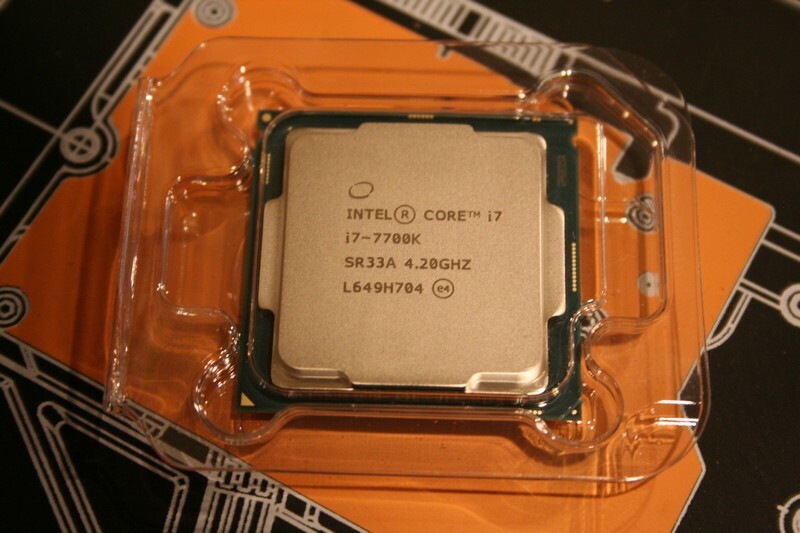 This processor uses the LGA 1151 socket and an operating frequency of 4.2 GHz. 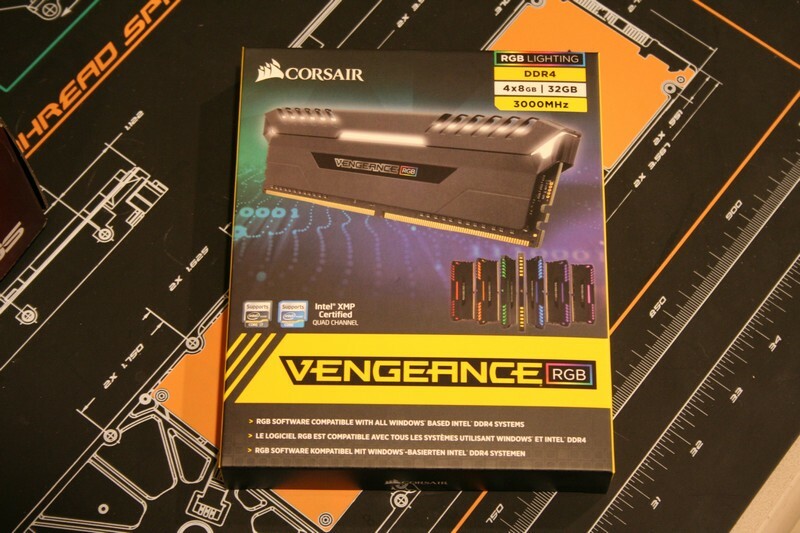 As for memory, I am using the Corsair Vengeance RGB modules. 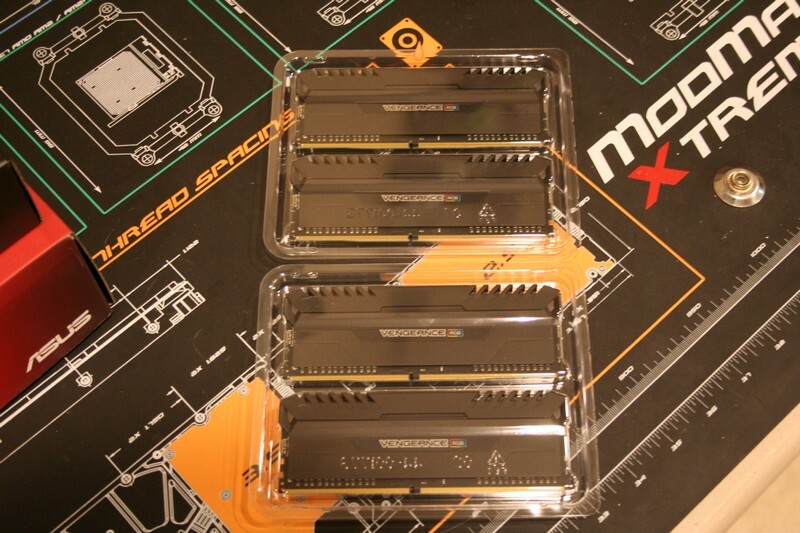 This kit consists of four 8GB modules, for a total of 32GB of available memory. The speed of the modules is rated at 3000MHz. 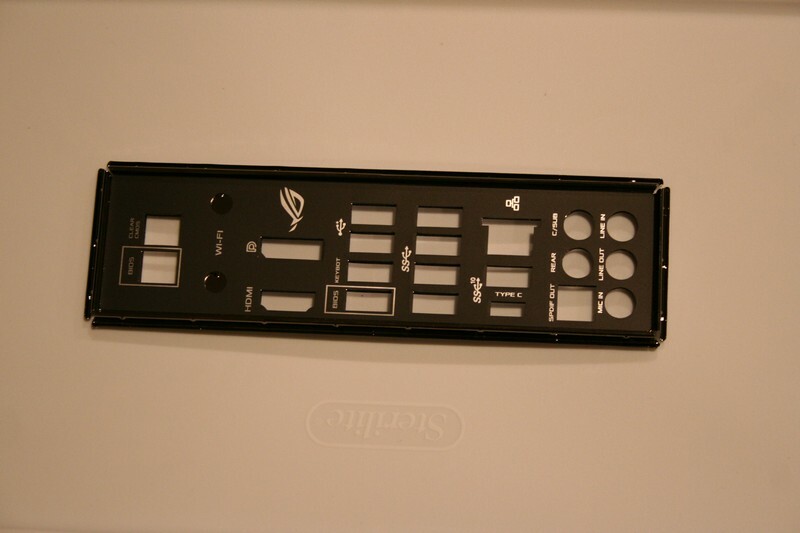 The key feature for this kit is that they contain RGB lighting on the top of each module. 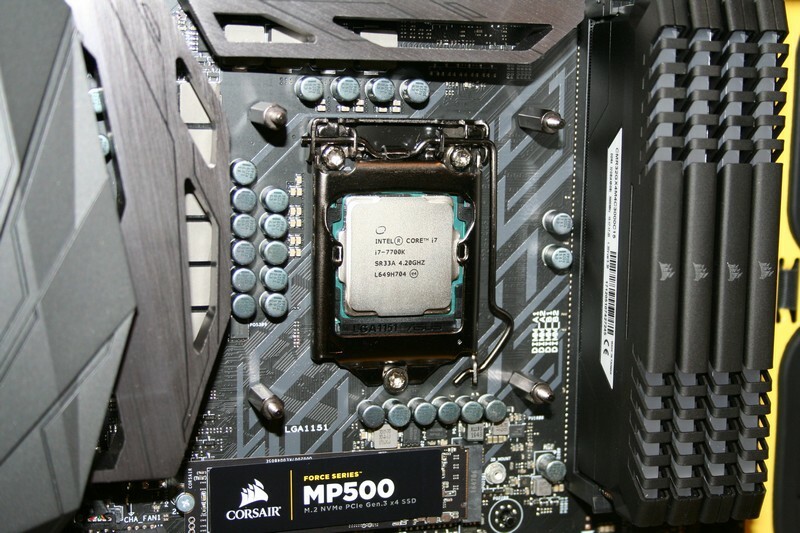 Here are two shots of the CPU and memory modules installed on the motherboard. 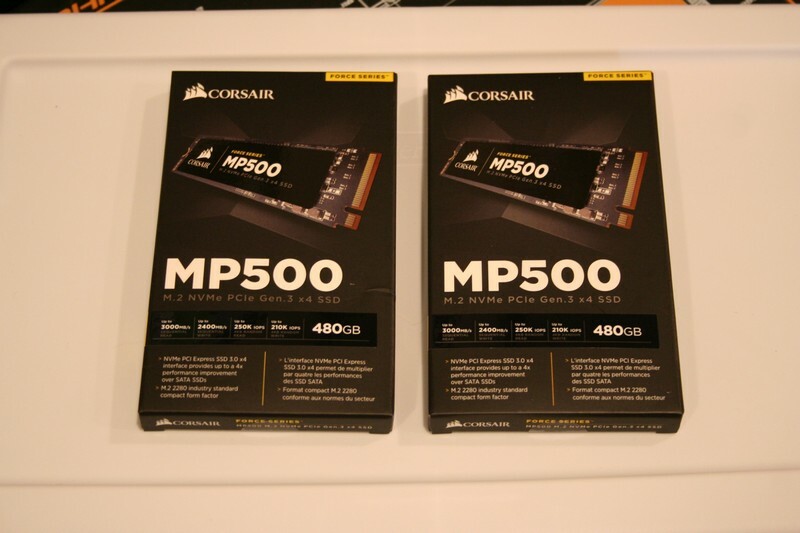 Almost forgot about the NVMe M.2 SSD drives. 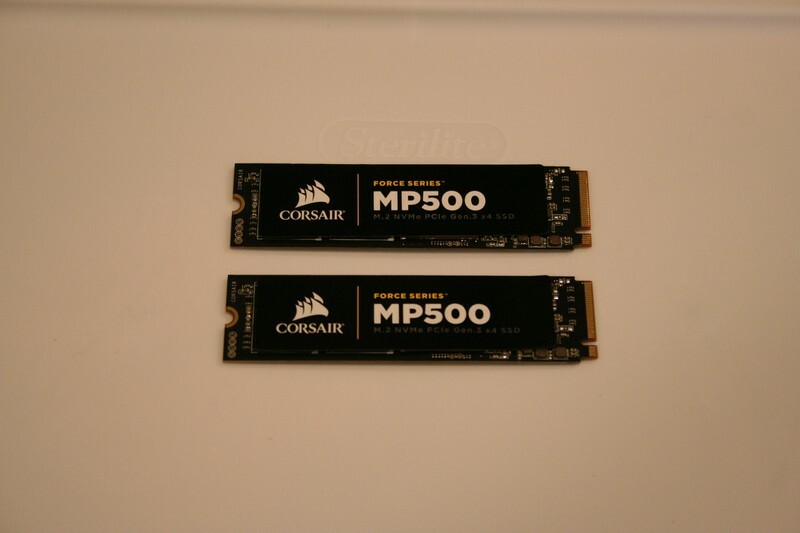 These are the 480GB version and are about the size of a stick of gum. One is mounted above PCIe slot 1 and the other is mounted near the bottom of the chipset heatsink. I intend for one to be the boot drive holding Windows 10 and other non-gaming programs, while the other will be used for my frequently played games. The speed of these units will ensure minimal loading times. After a few days of drying I finally got around to reassembling the case frame. 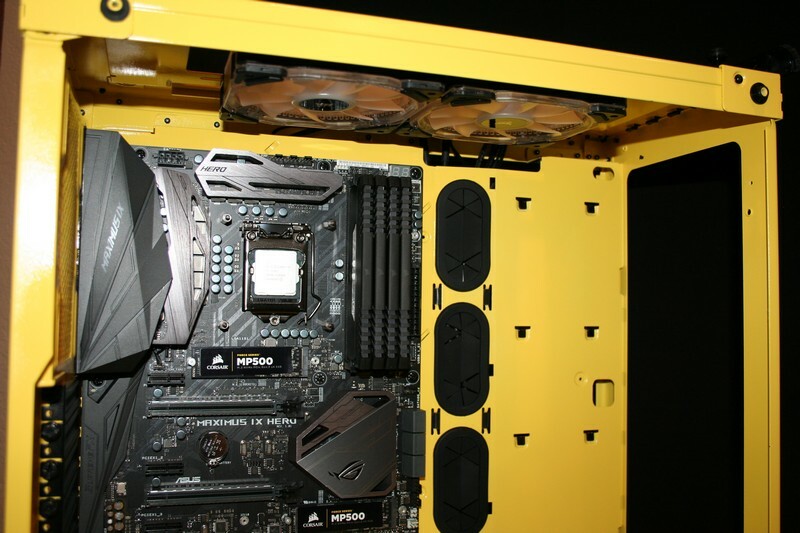 The yellow case and black accessories really complement each other nicely! Just so you know, it took 73 rivets to reassemble this case! 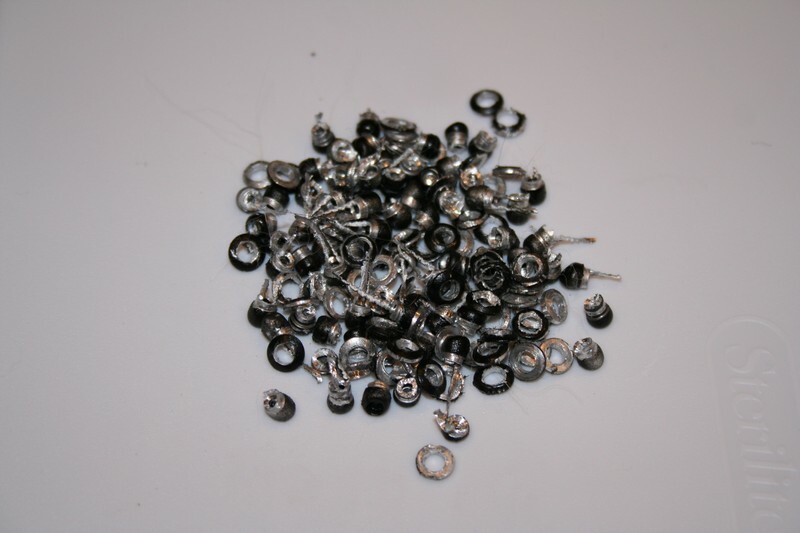 Ensure you have a good supply of rivets on hand during the reassembly process! Started with the bottom panel then added the front and rear panels. 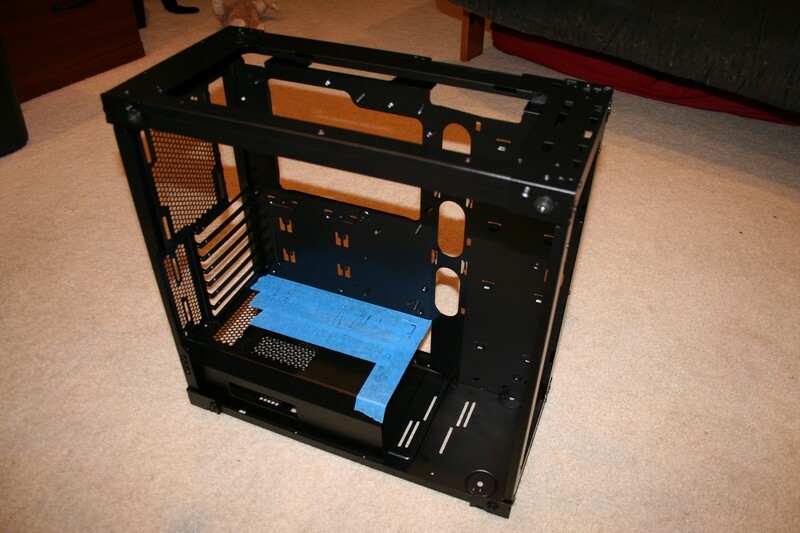 After they were riveted together I added in the motherboard tray and finally the top panel. Once these were all secured, I riveted on the eight corner pieces. If you aren't careful during the reassembly process and get it out of order then you may have to redo some of the rivets since this thing goes together much like a jigsaw puzzle. 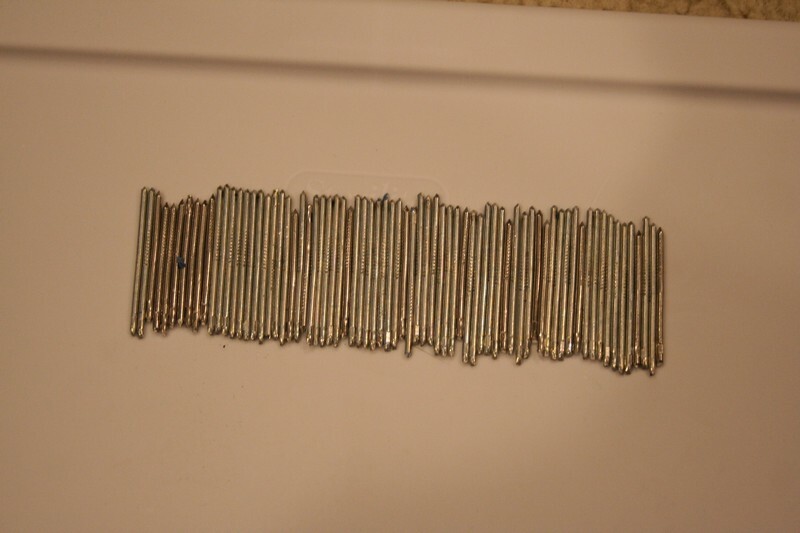 Here is a shot of the rivet posts left over after the riveting process. Starting to plan out the sleeving for the wiring. This build will only be utilizing the 24-pin ATX, 8-pin EPS, 8-pin PCI-E and 6-pin PCI-E cables for sleeving since they will be the only ones visible. 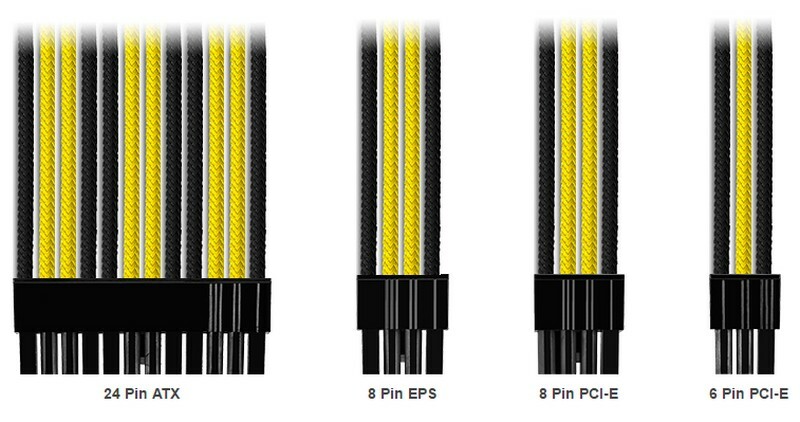 The 24-pin ATX and 8-pin EPS are for the motherboard, while the two PCI-E cables are for the graphics card. Here is a shot of the design scheme. 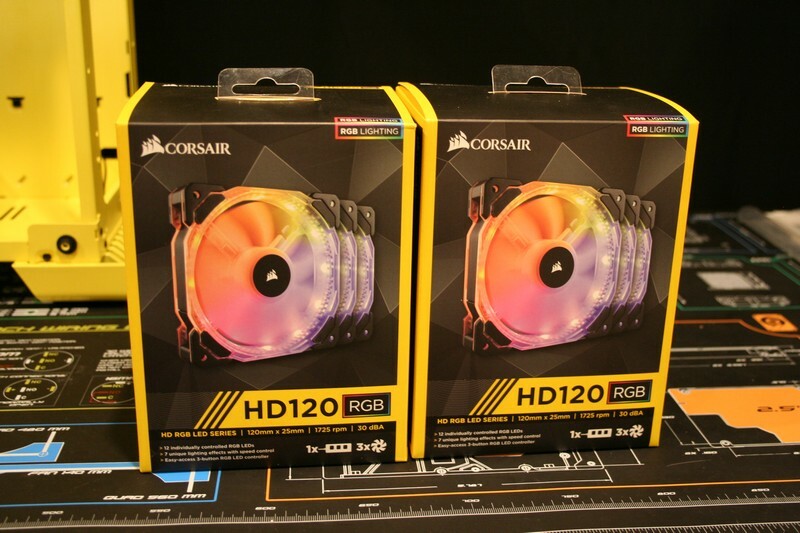 Corsair provided two 3-packs of their HD120 RGB fans. 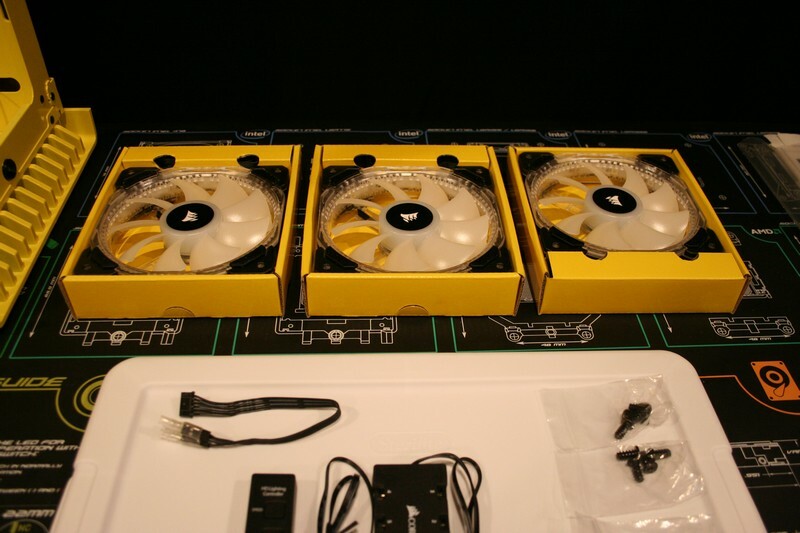 Each package contains three of their new HD120 RGB fans, 12 fan screws, Fan Hub, Fan Controller and an optional cable to connect the fan controller to pushbuttons for selecting mode, color and speed. 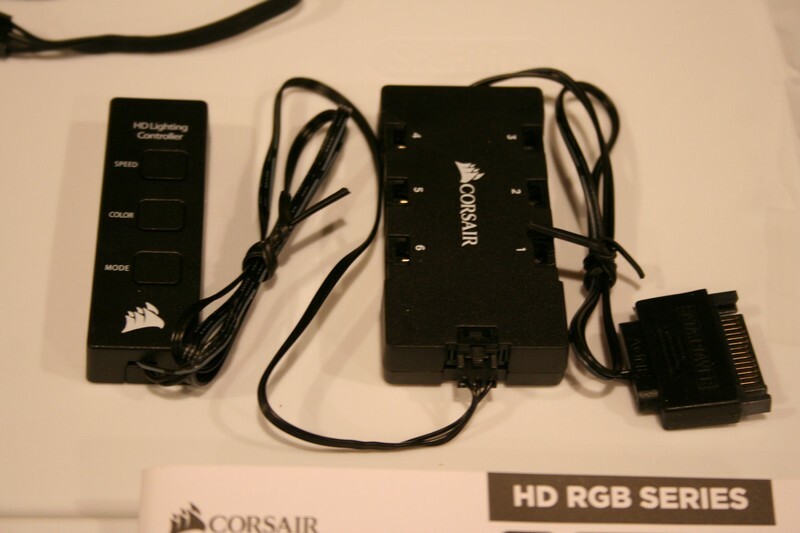 The included HD Lighting Controller is necessary to take full advantage of the HD120 RGB fans. The Corsair 570X case comes with the SP Lighting Controller since the case includes the SP120 RGB fans. This will make an excellent replacement! 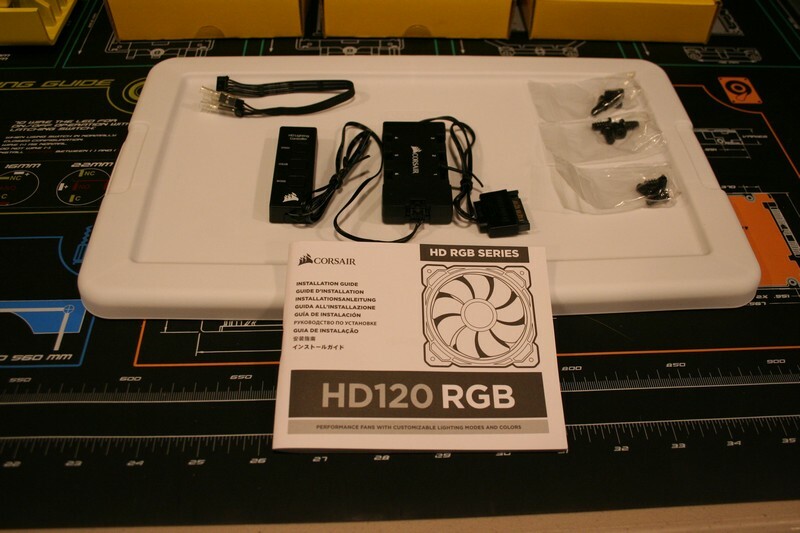 Here are the six HD120 RGB fans. They are solidly built and have built-in cushions on each corner to absorb vibrations. It is so nice to be able to work with a mid-size case where I only have to worry about 6 fans. My last build (Apeiro) contained 14 fans and the case before that (BAWLS) contained 20 fans! Now to get that motherboard mounted into the case!! 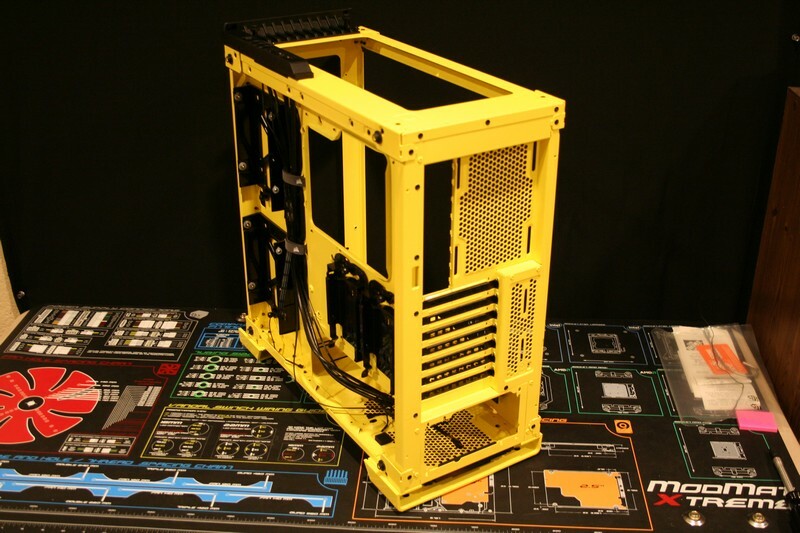 The I/O backplate will complement the black/yellow theme due to it already being black. 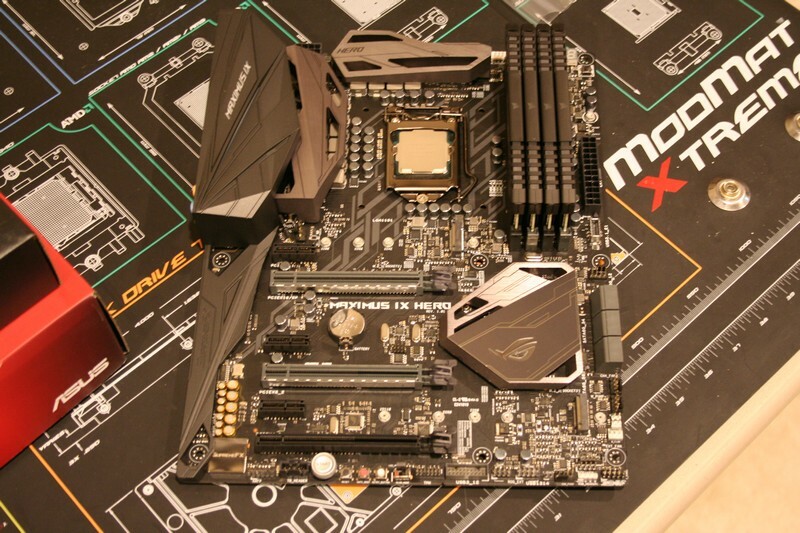 Here is the ASUS Maximus IX Hero motherboard mounted and ready! Last edited by NavyChief; 04-12-2017 at 09:17 PM. 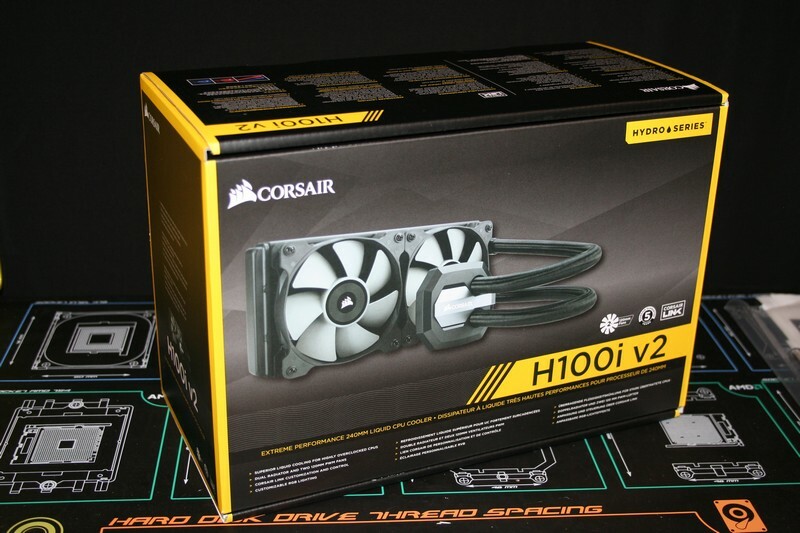 The Corsair H100i v2 All-in-One (AIO) CPU cooler is a beautiful device for those wanting to go beyond the typical air cooler but not quite all the way to the custom watercooling components (i.e. pumps, reservoirs, blocks, hose, fittings, etc). 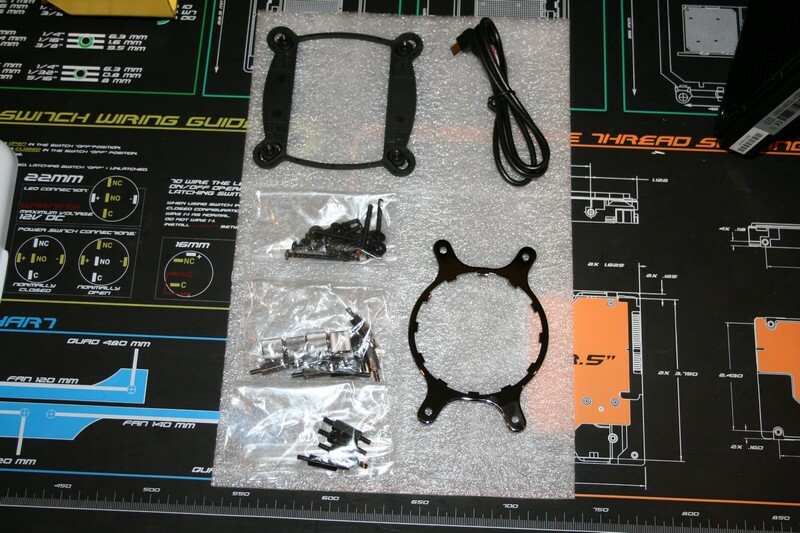 Included in the kit is everything you would need to mount the AIO (240mm radiator, two SP120L PWM fans, and numerous accessories). 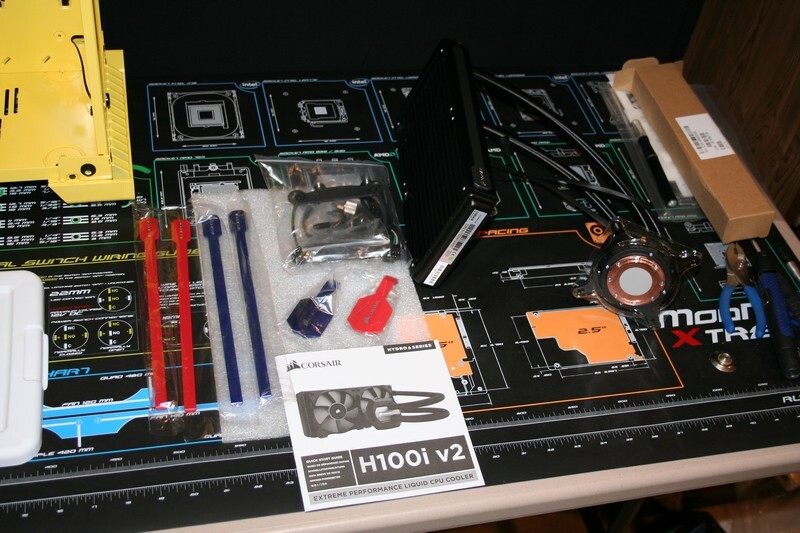 This kit is compatible with any Intel LGA 1150, 1151, 1155, 1366, 2011 and 2011-3 and any AMD socket FM1, FM2, AM2 and AM3. The red and blue accessories in the photo are from the optional H100i/H100i v2 Color Kit. The radiator/pump/CPU block are absolutely stunning! The braided tubing really complements this set. 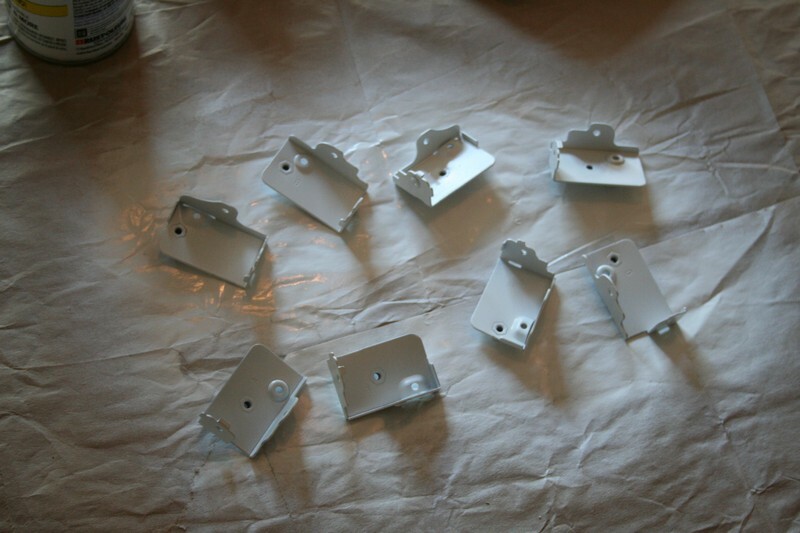 Here is a closer look at some of the mounting accessories included. 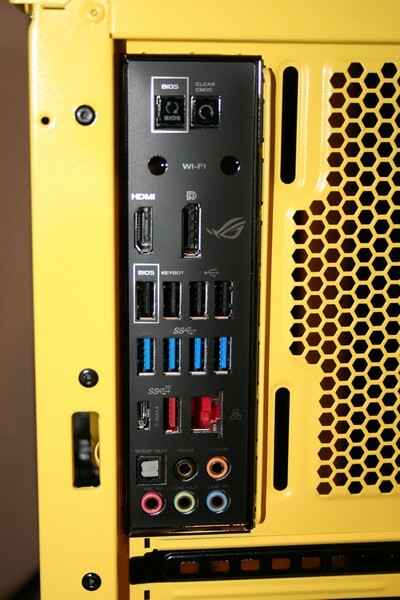 The mounting bracket in the upper left goes on the back of the motherboard. The cable runs from the CPU block to a USB port on the motherboard. 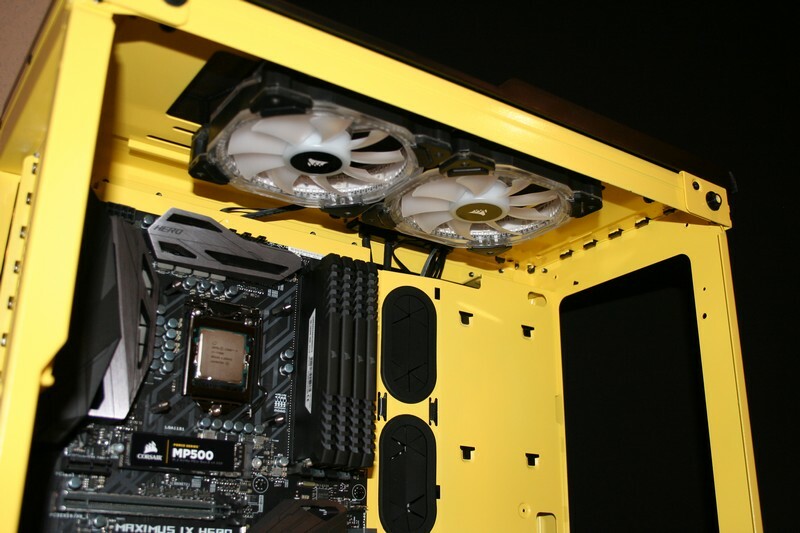 The lower ring is for AMD motherboards. 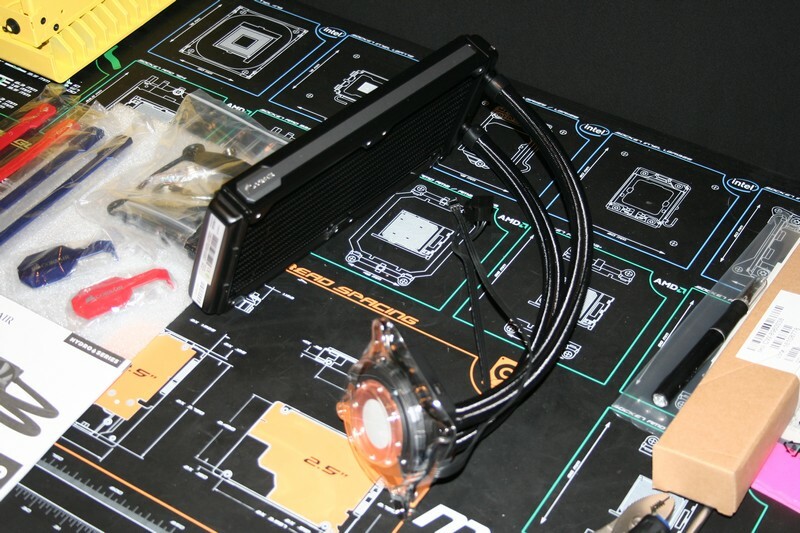 Here is what the mounting bracket looks like on the back of the Maximus IX Hero motherboard. 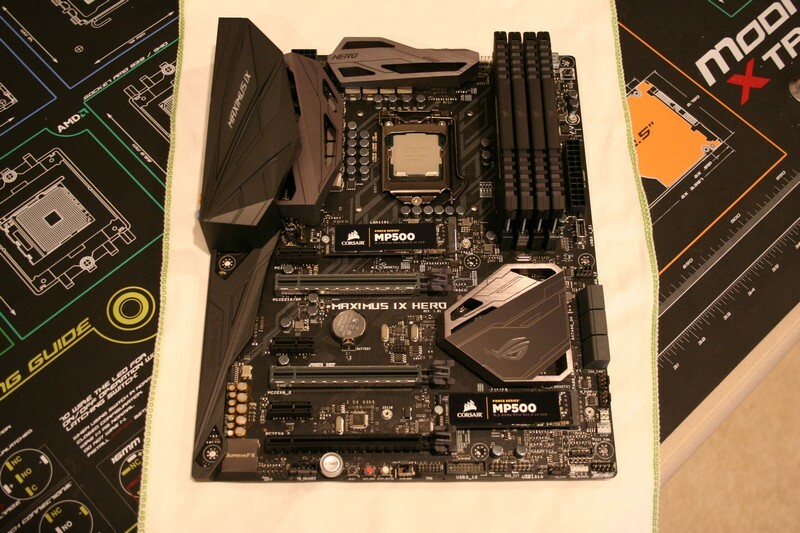 The front side of the motherboard only shows the posts that the CPU block attaches to. I tried to mount the H100i v2 to the top of the 570X case but the fans hit the top of the Vengeance full-size memory modules. It just does not fit, so I went with Plan B and mounted two HD120 PWM fans to the top mounting bracket. Here is a shot of these fans from the top. 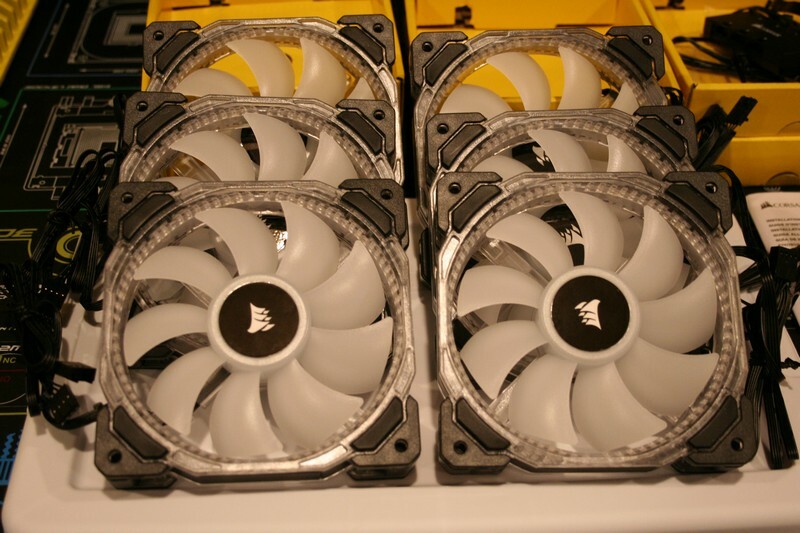 With just these two fans mounted, you can see that there is not much additional clearance between the bottom of the fans and the top of the memory modules. 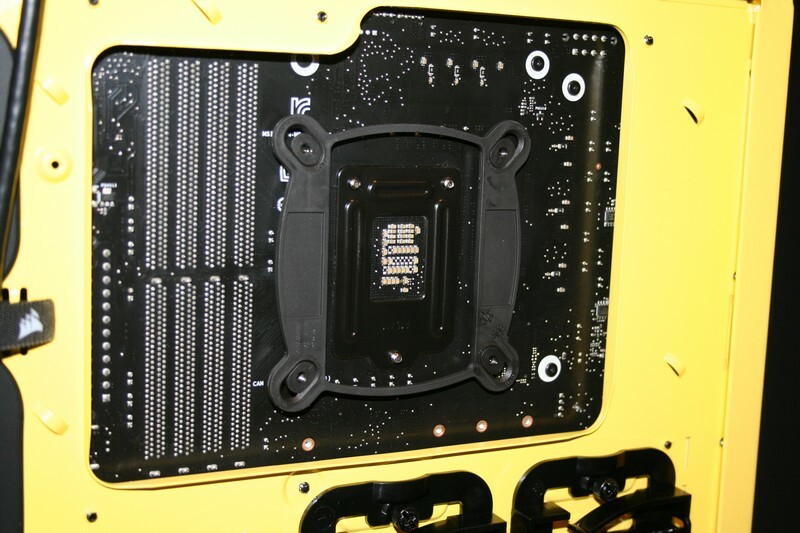 The upper access holes above the motherboard tray allow the fan cables to be hidden easily.